A flooded street in San Juan, Puerto Rico after Hurricane Maria. Photo by US Department of Defense, released to public domain. When Hurricane Maria hit Puerto Rico, it brought the worst storm damage that the Caribbean island and US territory has seen in nearly a century. For more than two weeks since the storm, Puerto Ricans have faced life-threatening shortages  of food, water and fuel. More than 90% of homes  are still without electricity, 60% without water , and 75% of telecommunications networks  are still inoperable. Federal estimates and local reporting on the death toll also vary vastly. Facts and figures like these have critical importance in any disaster relief effort. They are essential to understand the situation and make decisions about how to allocate resources towards recovery. They can also be key tool for citizens and media outlets working to hold government entities accountable for their commitments to the public. Accountability is further complicated by the fact that Puerto Rico, as a US territory, has just one representative  in the US Congress, who is not afforded full voting rights. And while congressmen and congresswomen of Puerto Rican origin are standing up on behalf of Puerto Rico, their calls to action  are largely being ignored. Who determines the death toll? The storm’s official death toll is among the most important of figures being reported. For several days after the storm, the death toll hovered at 16 , according to US authorities. But just hours after Donald Trump concluded his press conference in San Juan on October 3, the US government released an updated count of 34 . Local investigations however suggest that the storm’s actual death toll may be much higher. In an interview  with Public Safety Secretary Héctor Pesquera, the San Juan-based Center for Investigative Journalism (CPI)  learned that at least 200 people died in Puerto Rico from September 20 through 29, a number that well exceeds the normal quantity for such a short period. And this only reflects official records — the lack of electricity has left state agencies having to register these numbers by hand, thus prolonging the process. In interviews at Hospital Pavía in Arecibo, CPI learned that 49 people had died  at that hospital alone in the first two days after the hurricane, during which the hospital had almost no electricity. Puerto Rico Governor Ricardo Rosello reported on October 3 that 63 of the island’s 69 hospitals had re-opened. But what does it mean for a hospital to re-open? State officials explained that this simply means that hospitals are accepting some patients. A roster released by the state government indicates that 29 of 63 the hospitals  that are being described as “operational” still do not have electricity. The US federal government has also shown reluctance to release comprehensive data about the situation. On October 5, users noticed that detailed statistics on water, electricity and other key resource shortages that had been published and routinely updated on the website of the US Federal Emergency Management Agency (FEMA) suddenly disappeared . Statistics describing the relief effort — mostly “positive” numbers, such as the quantity of hospitals, grocery stores and gas stations that have re-opened — remained online. After multiple media outlets reported on the incident of censorship, the numbers reappeared. But this hasn’t quelled public concern that the administration is actively attempting to block the public from knowing what’s happening on the island. In an interview with the Washington Post , Illinois Congressmen Luis Gutierrez, who is of Puerto Rican descent and has visited the island since the hurricane, openly accused the administration of trying to prevent information about the devastation from reaching the public in the continental US. “They don’t want you to know the truth…every story we get is a story of human tragedy. Of life and death and that struggle,” he said. When we came back, we said the same thing that every reporter who’s gone down there has said: This is a humanitarian crisis. If the news is not good, it must be fake! 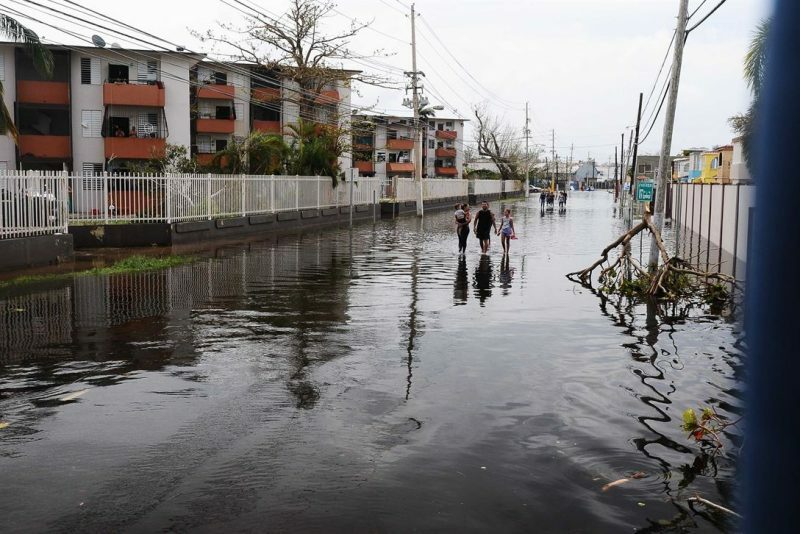 Alongside the uneven reporting of storm damage, Donald Trump and his administration have openly sought to control the broader public narrative about Hurricane Maria and its effects. Administration officials have deliberately promoted and encouraged “good” news about the recovery effort, and openly intimidated public officials and media seeking to do otherwise. A few days prior to Trump’s visit, Acting Director of Department of Homeland Security Elaine Duke praised the US government  relief effort in Puerto Rico, describing it as “really a good news story.” This drew quick criticism from San Juan mayor Carmen Yulín Cruz, who described the devastation as a “people-are-dying story” . Trump almost instantly lashed out at the mayor on Twitter, accusing her of “poor leadership” and charging that she had been told by democrats to be “nasty” to him. Beyond his attacks on Yulín Cruz, Trump’s Puerto Rico-related tweets focused on two ideas — the “successful” (in his words) relief efforts of first responders and the US government agency FEMA, and the specter of “fake” media coverage of the devastation. My mother finally got through to me today. She’s running out of food and describes her surroundings as a war zone. That’s the real news!